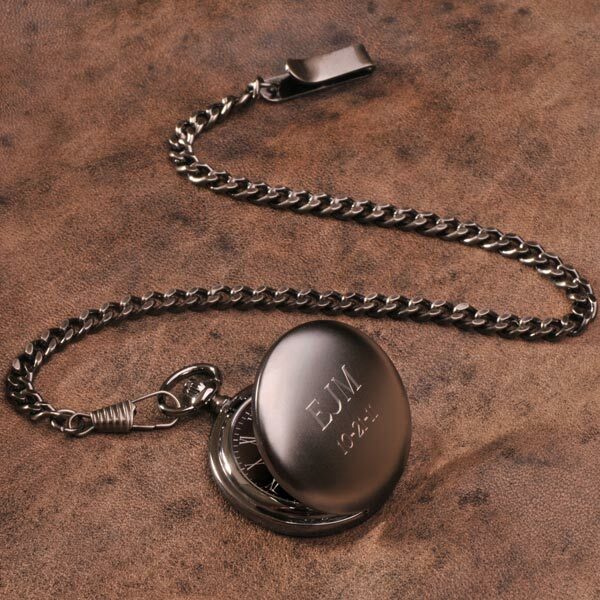 Handsome and a little bit mysterious, our Personalized Midnight Pocket Watch is classic with a modern twist. Featuring an attractive black finish, the matching black face adorned with white Roman numerals. Secured with a sturdy matching 14" chain, this watch with Quartz movement is a great keepsake gift for any occasion including graduation, Father's Day, or a special birthday, and is an ideal present for the Best Man or groomsman. Measures 1 1/2" in diameter. Personalize with three line of up to 10 characters per line. Allow 3 weeks. No rush delivery or gift box. Item can only be shipped within the Continental US.